The Flood Alert service of the Swiss Army is a service provided by troops used for the observation and defense of the many dams of hydroelectric plants in the Swiss Alps. The observers are connected with the National Alert command by landlines, as a backup, wireless connections were installed using special VHF equipment, frequencies just below the FM bradcast band were used for this purpose. The solid state station SE-221 did replace the hollow state SE-223 which was ten years older in the year 1969. For the Flood Alert service assured by observer and defense detachments at dams of hydroelectric plants in the Swiss Alps, wireless VHF links were used as a backup for landlines to be used in case of an emergency. The wireless stations use frequencies in the VHF band just below the frequencies of the FM broadcast band. In the first years, an adapted police station RT 5 made by Brown Boveri Corp. was in use, this station with the designation SE-223 came in several wooden transport crates and was very bulky and heavy. 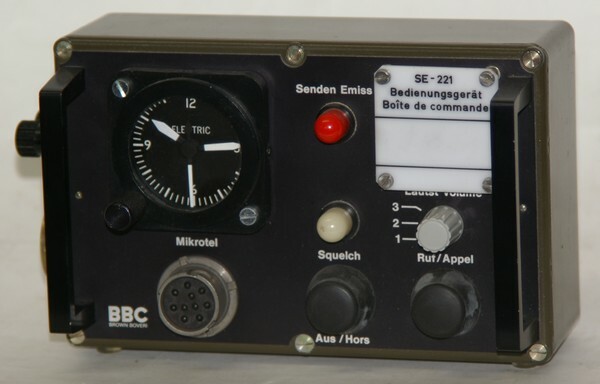 It was replaced by the solid state compact station RT24 also made by Brown Boveri in 1969, this got the designation SE-221. 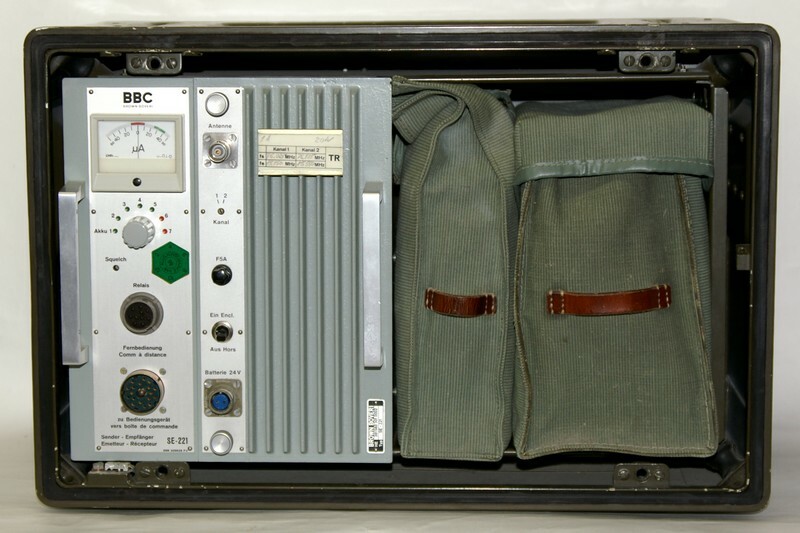 The VHF wireless station SE-221 (RT 24, a police wireless station RT 22 adapted for military use) is a compact solid state unit taking only half of the volume of a compact aluminum case. At the left side, below a measuring instrument which can be used to control the important operation voltages, there are connectors for relay service and the (remote) control unit. In the right unit, next to the cooling heatsink, there are the connectors for external 24V DC power, the main switch, a fuse, a channel selector and the antenna socket. In the original configuration, a yagi antenna was in use. In a storage compartment in the case, there are two canvas bags: one for the headphones / microphone garnish, the other one for the control unit with an electric clock and emergency equipment. This contains not only an electric torch to be used in case of an emergency but also a foldable candle lantern included the necessary candles to be used in a really really bad emergency when even the batteries fail... For transmit operation, the mains supply or at least some accumulators need to be connected to the set. TR version (Terminal - Relay: can be set up as terminal unit or as relay. I don't have access to the schematics of this station and no informations about it's predecessor SE-223. Between 1969 - 1973, 150 sets have been purchased, they were withdrawn in 1992 and replaced by the SE-225, a VHF transceiver with automatic frequency selection (trunked radio station).